This assignment is not for a grade, but we do need you to complete it to get you registered and assigned to a lab section. If you run into troubles, please reach out on our Piazza forum. We’ll make sure that you know how to download an assignment, check in your solution, and submit it to us for grading. This assignment will introduce you to the basics of Git, the version control system that we will be using throughout the course to keep track of your work. Our Git repositories will be hosted on GitHub. Version control systems are widely used for software development in industry as well as in the open source and academic communities. These tools enable teams of programmers to write code in a distributed setting and send it to a central repository for review and use. Alongside keeping a log of changes to the code, version control systems support the resolution of conflicts introduced by multiple changesets (e.g. two people trying to edit the same lines of the same file). Web interfaces like GitHub promote the practices of code reviews, where other team members will review proposed changes to check for bugs and provide feedback on the design and implementation. The version control skills that you will learn in this course will be invaluable for any future software projects that you decide to work on. This assignment assumes basic knowledge of the UNIX command line using an operating system such as Linux or macOS including how to edit a text file. Students using windows are required to set up a Linux virtual machine for all the assignments in this course (including this one). See the UNIX guide for more information about these topics. Those new to UNIX or wishing to brush up their skills may want to check out the library of introductory unix videos/guides maintained on the standard CS107 web site. Students are expected to be familiar with the material covered in the course guides which includes information about hardware and the Raspberry Pi (we will start working with this in week 2). Note: Please setup your environment on your local machine (laptop), as you will need it shortly to run programs on the Pi. Do not use a remote machine such as Myth. First, we will set up a directory to hold all the files that you will be using for this course. You can create this directory anywhere, but this writeup will assume that you are doing it in your home directory. Next, download the courseware repository: cs107e.github.io. This repository contains the lecture material as well as common files that we distribute for labs and assignments. Now we will run the setup script provided in the courseware repository to configure your development environment. This script assumes that you are using the bash shell. If you are using a different shell, please contact a CA to get help. To validate that the setup worked, run the following commands. You should see an output similar to what is shown (note that your PATH variable may contain many other entries). If not, contact a CA for help, as setting up your environment will be crucial for building and installing all the code in the course. Open a terminal window (e.g. Terminal.app on macOS) and enter the following commands. Each command begins with a prompt character $ , followed by a text string. Your open terminal should also have a (possibly different) prompt character. To enter a command, type the entire string the follows the prompt character $. These commands configure Git with your identity, which will be associated with the commits (code changes) that you make. Use the following command to verify that you have correctly updated your Git configuration. This classes uses GitHub to host all the assignments. Students will use GitHub to download assignments and upload their own solutions for grading. When enrolling for this course, you should have provided us with your GitHub username. Each student will be given a private repository inside the CS107e organization to use for assignments. Once we have set up your repository, you will receive an an email invitation from GitHub which indicates that you are ready to move on to the next step. Note: For the rest of this assignment, replace all instances of [YOUR-GITHUB-USERNAME] with your GitHub username. To begin, clone your personal repository under cs107e_home. This clone command will download the starter code into a new folder called assignments. You’ll do your work inside that folder. NOTE: You may have to type in your GitHub username and password to perform the clone. To work with GitHub without supplying your username or password each time, follow these instructions to setup an SSH connection. Next, run the command cd assignments to descend into the assignment folder, and run ls to see show the contents of the directory. There should be just one starter file: lab.txt. To begin working on your assignment, you will switch to a branch we created for you called assign0-basic. Future assignments will follow this same naming conventions: a number for the assignment, and a suffix -basic or -extension for basic and extension submissions. For example, your assignment 7 extension should be done in the assign7-extension branch. Then, use the checkout command to switch to a branch. Open lab.txt in your favorite text editor and replace the contents with one of the following four options. Make sure you use the exact same text. Your submission will be processed by an automated tool that expects these exact strings. For example, if you have preference for Tuesday but could go on Wednesday, lab.txt should have one line that says Tuesday. If you can only make Wednesday, then the file should hold a single line that says Wednesday, can't make Tuesday. Now you will commit your changes to save the current state of the repository. Git records a log of commits, with each commit pointing to a different state of the repository. A commit log provides a history of changes to the code, akin to different versions of the code, and is the foundation for the more advanced uses of Git as a version control system. Git will only commit changes to files that have been previously staged. This feature allows users to selectively record changes to the code. For example, if two files have been edited, the user may decide to only commit changes to one file. In this case, the user would only stage the file of interest before committing, and changes to the other file will not be included. Your branch is up-to-date with 'origin/assign0-basic'. $ git commit -m "Entered my lab preference." [assign0-basic 019f726] Entered my lab preference. Here the -m flag indicates to Git that the following text string should be used as the commit message. Alternatively, you could run the command git commit without the -m flag and Git will open a text editor which you can use to record a commit message. In the future, you will likely use this feature for longer commit messages that may describe a more complex set of changes. In practice, good commit messages contain a short (under 50 character) summary of the changes on the first line, followed by a more thorough description of the changes. Detailed commit messages enable programmers to look back in the history of changes to better understand when and why parts of the code were changed. Good commit practices give programmers the ability to navigate the history of code changes, as well as providing the opportunity to revert to previous versions. Sometimes you may find that you want to revert to a commit before a set a changes that introduced a bug in your code. The more you commit, the more opportunities you will have to restore previous working states without losing as much work. We recommend that you commit often and that you write detailed commit messages. The previous Git commands created a branch and recorded the changes to a local copy of your repository. Next, the new branch and changes will be pushed to GitHub so that the online version of the repository matches your local copy. This gives the course staff access to your changes for grading. To do this, you will us the command git push as follows. Note that specifying -u origin assign0-basic tells git to push your newly created branch to the remote copy of the repository. 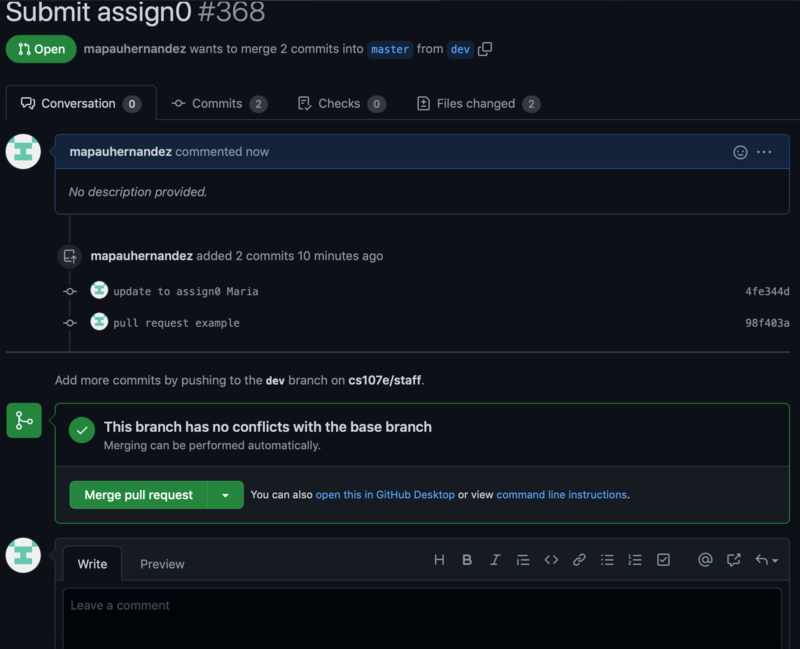 You only need to do this once for new branches (that is, for the subsequent push later in this assignment, it’s sufficient to use git push without the extra arguments). Writing objects: 100% (3/3), 265 bytes | 0 bytes/s, done. Branch 'assign0-basic' set up to track remote branch 'assign0-basic' from 'origin'. Create a file called background.txt that contains answers to the following questions. Responses to these questions will be graded by a human, so no need to follow strict formatting requirements. However, please ensure that your responses are clearly labeled (i.e. we know what question it correspond too) and reasonably organized. What is the result of performing a bitwise OR of the following two hexadecimal numbers (include the result in decimal): 0x0f OR 0xff. Now left shift that number by 24; what is the result in hexadecimal? Assume numbers are 32-bit. How many milliamperes of current will flow through a 1.5K resistor connected to 3V on one end and 0V (Ground) on the other end? Find a file in the directory /etc on your computer; send us the name of the file and the number of bytes contained in that file. How many files and directories are contained in the first level of directory /etc (absolute path)? Include the commands you used to answer these questions. Use the git commands you learned in the previous steps to stage this file and commit it to your local repository. Then, push your changes to your GitHub. In this course, assignment submission is done using GitHub’s pull request feature. 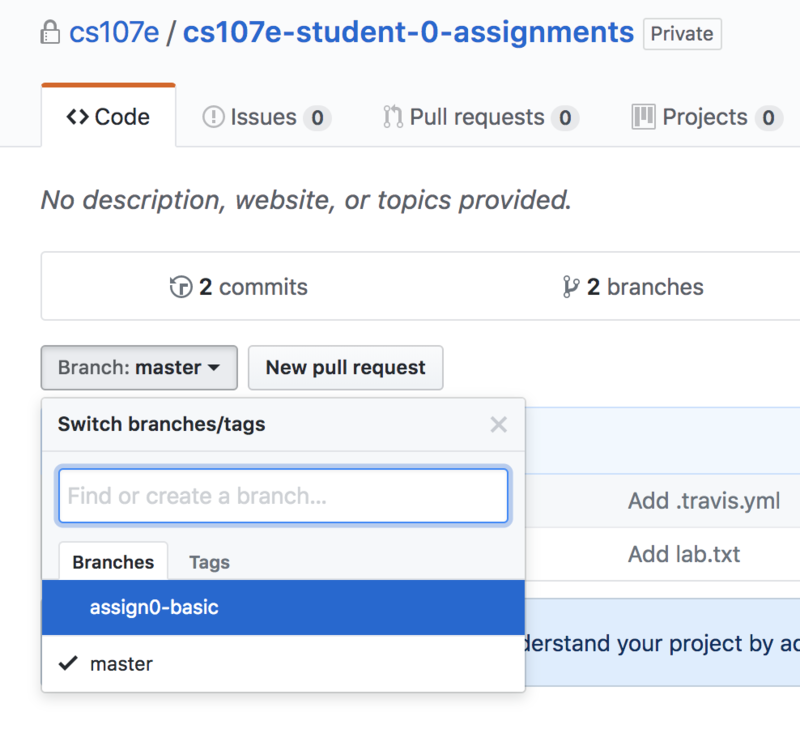 Pull requests provide a summary view of changes made to the code as well as a section for comments where course instructors will be providing feedback. The pull request model is used by many modern software projects to promote good practices when working in a distributed development environment. The typical flow starts with a base branch (often called master) that reflects the master copy of the code. 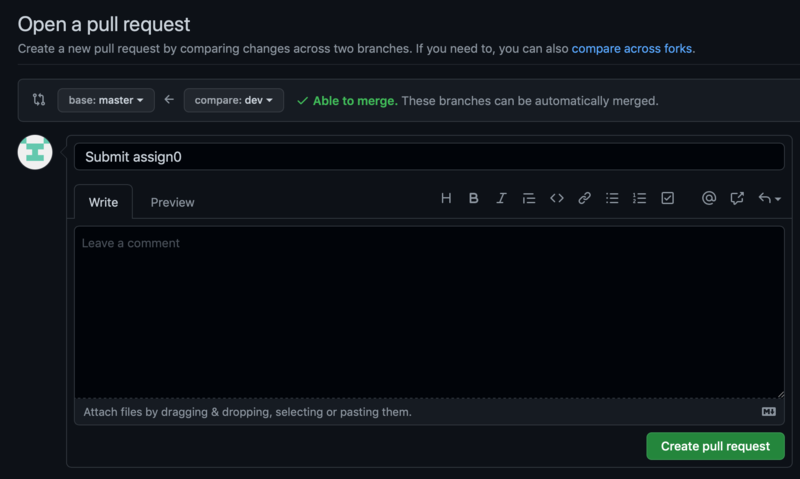 Feature development or bug fixing occurs by creating a new branch where changes are made, followed by the submission of a pull request to the original base branch. Team members use the pull request to review the proposed changes and provide comments. Once the changes have been approved, they are merged back into the base branch. In this class, we use a similar model, except a grader will be reviewing your code and the base branch is the starter code. Open the assignment repository page in your browser and make sure that it is on the branch assign0-basic. Alternatively, go directly to the appropriate page by using the url https://github.com/cs107e/[YOUR-GITHUB-USERNAME]-assignments/tree/assign0-basic. Click the ‘New pull request’ button. Now you will see text entry boxes for describing the pull request, followed by a list of the commits that you have made and a line-by-line comparison (diff) of the changed files. Set the Title to “Submit assign0 basic” and leave the description blank (for future assignments you can include comments for your grader in the description). There is a section indicating whether our automated checks have passed. You may need to wait a minute or two and refresh if have not finished. If the checks have passed, you will see a green checkmark and a message: “All checks have passed”. If the checks did not pass, make sure you have inserted a valid choice in lab.txt (one of the four choice we provided) and added a background.txt with answers to the background questions. Each assignment has a set of automated checks that will be run upon submission. For this assignment, the check just verifies that lab.txt contains one of the four valid choices and that the background.txt file exists. Note the initial starter code will not pass the check until both criteria are met. To see more about the results and why the check is failing, click on the ‘Details’ link (you may be prompted to register for Travis and sync your Github). The pull request page will update to reflect any changes that are pushed after the initial submission (e.g. to fix any errors the checker detected). This page will also be used by graders to provide feedback on your submissions. Note: The time of the last commit you push onto the pull request, not the time you clicked ‘Create pull request’, will be considered your time of submission for deadlines and late days. For example, creating a pull request at 11:59 and pushing an extra commit at 12:01 to fix an error from the autochecker is considered a day late. This means that making a change to your submission is as easy as changing the file and pushing it to the assign0-basic branch. There is no need to create a new pull request every time you need to modify your submission! Click the ‘Files changed’ tab to see your whole solution from top to bottom, along with any inline comments that the grader has added. When finished with their review, the grader will click the Merge button themselves. This is similar to how a coworker would merge a pull request when they are satisfied with the quality of the code changes that you have proposed.